Camellia japonica are one of the most versatile flowering shrubs available. Great evergreen foliage, wonderful flowers and easy care. Known as the Japanese Camellia, Camellia Japonica is actually native to both Japan and China. With many wonderful varieties, they are equally at home in the part shaded garden border or as a feature plant. They make a great hedge plant and Camellia Japonica are easy to care for. With a medium rate of growth they will eventually reach 3-5m depending on conditions but can easily be pruned to maintain shape. The main growing requirements are protection from the hot afternoon sun and a well drained humus rich soil. They can be grown in full sun however flowers may tend to suffer in hot direct sun. One of the great characteristics of these plants is the ability of to grow and flower well in part shade. If you take care of them through the first few summers you will find them remarkably drought tolerant as well. Seasonal applications of a specialist camellia fertiliser, and a deep watering every 2 weeks in summer is about all these plants need. Easily pruned after flowering to maintain shape, C.japonica can be pruned back hard if required. Widely used in the garden border as a background plant, C. japonica has a number of other uses. They make great hedging or screening plants, they will grow well in containers and as they are easily pruned are suited to growing in courtyards and can even be grown as a semi espalier. They are are also suited as a feature specimen plant, magnificent flowers in season and good foliage year round. Flower types include single flowers and double types and varieties are numerous. popular Camellia Japonicas include, Nuccio’s Gem a large formal double flowering type has white flowers flushed with pink. Camellia japonica ‘Debutante’with its Peony Pink flower is very popular. ‘Desire has soft pink flowers and is a doubled flowered variety. 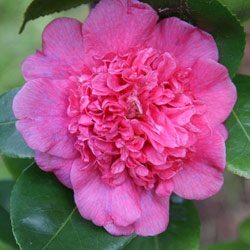 A moist humus rich well drained soil is ideal for Camellia Japonica. Prepare the planting positions well in advance and dig in some well rotted compost and cow manure. Always use well rotted manures to prevent burning of root systems. Holes should be larger than the pot, however plants need to planted at the same level as they were when in the pot. Camellias can be staked to promote an upright habit. Water in well and maintain a moist soil for the first few summers. Camellia Japonica are remarkably tough once established. Some people recommend creating a saucer or depression around the base of the plant to allow water to collect, be careful not to allow mulch to collect in this around the base of the plant. Like most plants camellias appreciate feeding during the first phases of growth in spring, just after flowering. Specialist camellia fertilizer is best as this tends to balance the Ph of the soil. Remember to water well before fertilizing. A supplementary feed with well rotted cow manure and some mulch in late spring will give them an extra lift. This is also a good time to check the soil pH look for 6 – 6.5. Keep in shape with light pruning after flowering. Heavy pruning if required is OK with these resilient plants. Be adventurous, try espaliering a Camellia japonica. Or why not try pruning back to a formal hedge. Always use sharp secatures or a hedging shears. Camellia Japonica are relatively hardy and pest resistant.